The ultimate goal of the National Space Society is nothing less than the settlement of space and the use of its vast resources for the dramatic betterment of humanity. …the ultimate goal of human exploration is to chart a path for human expansion into the solar system. President Bush’s space vision…is to begin now for a future in which the material trapped in the sun’s vicinity is available for incorporation into our way of life. Democrats, Republicans, and the National Space Society all agree in a general sense as to what the future of humanity in space should be. The National Space Society’s near-term strategy is to support those aspects of the space program that most accelerate humanity’s drive towards this goal. It has been said many times that the Earth’s resources are limited and this is true. It is also true that the average human is very poor by American standards. The poverty line in the United States is a factor of three below our per capita income. The average human lives at a standard of living well below our poverty line. The per capita income of the average human is a factor of seven below that of the average American. In the long run, the average human standard of living should be increased to at least what it is in the United States today. Even if we assume that human population does not increase and that the American standard of living does not increase, then to accomplish this goal, the human economy must increase by a factor of seven. To a first approximation, this means that resource consumption must also be increased by a factor of seven. When we take into account the fact that in actuality the population will continue to increase and that we want the standard of living of America and other developed countries to increase and rightfully so, then this factor of seven becomes much larger. Where will we obtain the needed resources and do so in an environmentally benign fashion? The media has bombarded the American public with the idea that resources are limited, that we are beginning to reach resource constraints, and that the environment is deteriorating. According to polls taken just before the current recession, the average American believes, for the first time in history, that future generations will be worse off than they are. Europeans are even more pessimistic. A fundamental part of the American dream is that each generation will be better off than the one before. Americans no longer believe this to be true. There is a profound hunger in the land for a vision of the future, which allows the American dream to be restored. Fortunately, the vast majority of the resources of the solar system in terms of both energy and materials lie in space rather than on the Earth. This is true by many orders of magnitude. For example, the Sun produces 10 trillion, that is TRILLION with a T, times the amount of energy currently consumed by humans. In the long run — and I will not speculate tonight on how long it will be — the Earth’s resource constraints can be overcome by the resources of space. There are some who argue that Americans should seek to meekly accommodate themselves with the resource constraints of Earth. This is not the American way. Americans deal with constraints by SMASHING them. In the long run, space allows us to do this. 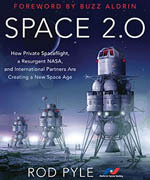 Space is not just about obtaining new technology, although that is important. Space is not just about applications, such as communication satellites, although that is important. Space is not just about new knowledge, although that is important. Space is not just about exploration, although that is important. Space is not just about defense, although that is important. Space is not just about all of these benefits combined plus the other benefits commonly cited by the space community. Space is far more important. Space is nothing less than the foundation of the human future. American society as a whole has not fully grasped this fact, because we in the space community are overly modest. Space is not a luxury. Space is not nice to have. Space is of fundamental importance to human destiny. Space and its resources can provide a prosperous future, a future which restores the American dream, a hopeful future for all. This article was written by Mark Hopkins, Chairman of the Executive Committee of the National Space Society. 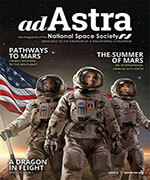 The article originally appeared in Ad Astra, Fall, 2011.